Robert Glass Opticians are proud to support local charities. For every pair of glasses we sell we contribute to our amazing chosen charities. Dr Kershaw’s Hospice was opened in 1989 (therefore celebrating 25 years of care this year) originally built with a legacy from Dr John Kershaw, a local GP. The Hospice provides specialist palliative care for adults with non-curable, life-limiting illnesses in a peaceful and homely environment. Dr Kershaw’s Hospice is an independent hospice and a registered charity. It is partially funded by the Primary Care Trust, circa £800,000 per year, however, the major part of the annual budget of £1.9m is supported by fundraising activities, donations, legacies, income from the Hospice shops and revenue from the Hospice lottery. Robert Glass Opticians is celebrating 25 years in business this year, and so our Oldham and Shaw practices has decided to support the worthy charity, Dr Kershaw’s Hospice. For every pair of glasses sold in our Oldham and Shaw practices we are delighted to donate to this important cause. Zoё’s Place provides palliative, respite and end-of-life care to babies and infants aged from birth to five years old suffering from life-limiting or life-threatening conditions. Liverpool was the first Zoё’s Place to be opened in 1995. Zoё’s Place can take up to six infants at any one time, providing care on a one-to-one basis, 24 hours a day, 7 days a week. We rely upon the generosity of the public to help us raise the £1.4 million a year we need to keep the doors open for the many families that rely on our expert care. Robert Glass Opticians is celebrating 25 years in business this year, and so our Liverpool practice has decided to support the worthy charity, Zoes Place. For every pair of glasses sold in our Liverpool practice we are delighted to donate to this important cause. St Ann’s Hospice cares and helps around 3,000 patients (over the age of 16) and their families and carers every year who are affected by cancer and non-cancer life limiting illnesses. Around 40% of inpatients at St Ann’s Hospice return home after treatment.St Ann’s Hospice provides care on 3 sites and in people’s own homes, working in partnership with acute hospitals, primary care trusts, community services and voluntary organisations. Our care is free of charge but St Ann’s Hospice has to raise £16,000 every day so our specialised staff can provide the highest quality care. Robert Glass Opticians is celebrating 25 years in business this year, and so our Cheetham Hill and Longsight practices has decided to support the worthy charity, St Annes Hospice. For every pair of glasses sold in our Cheetham Hill and Longsight practices we are delighted to donate to this important cause. 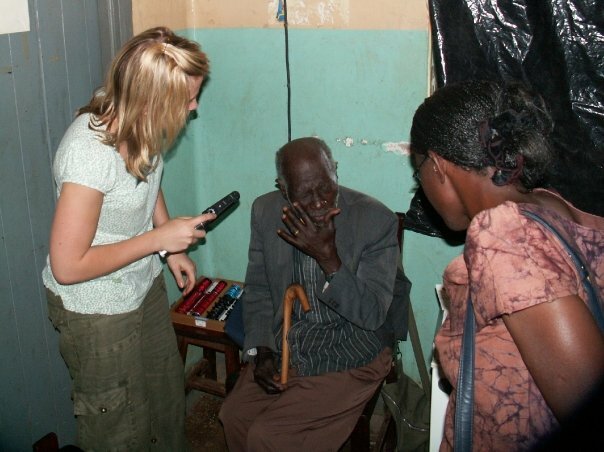 One of our Optician’s Anna visited and worked in a Vision Aid Overseas clinic in Uganda in 2008.